Throughout Tuscany the weekend of March 24-25, experience the 26th annual Spring Days, or Giornate di Primavera, hosted by Fondo Ambiente Italia (FAI). A nonprofit dedicated to restoring and preserving historical Italian landmarks, FAI has protected over 11,000 unique locations of Italian cultural heritage. During Spring Days, volunteers will offer free guided visits of designated heritage locations across Italy with a suggested donation of €2 – 5. Money from the Spring Days fundraiser is used to preserve and maintain many of the sites. This year don’t miss out on the many unique opportunities to visit landmarks across the provinces of Tuscany. Open: Saturday and Sunday 10 am – 5 pm. The Museum is housed in the premises of the former Serristori Hospital chapel founded in 1400 by Ser Ristoro. It is home to numerous paintings by protagonists of Florentine painting in the 17th century and to Giambologna’s marble sculpture depicting the head of the Redeemer. There is also an impressive fresco depicting the crucifixion dated in the first half of the 14th century. Museum of Sacred Art featuring works spanning the 14th – 16th centuries from local churches. 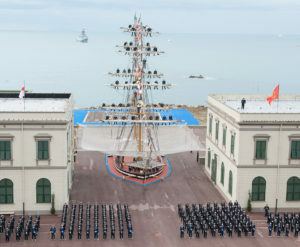 The Italian Naval Academy is a result of merging the Naval Academy of Naples and Genoa together and Livorno was selected for its medial location between the two previous academies. This landmark school offers a unique perspective into Italy’s military and maritime history, while simultaneously educating the naval military of today. Open: Saturday 10 – 6 pm, (final entrance 5:30 pm) and Sunday 10:30 – 6 pm (final entrance 5:30 pm) Entrance to this landmark is reserved for FAI members, with the possibility to register on the spot. This historical church in its modern form is a 14th century Gothic style enlargement of pre-existing Romanesque 9th century church. Located in Piazza San Francesco, this one of the most important churches in the city of Siena apart from the Duomo. Ruined by a fire in 1655, the basilica was restored to its current grand state at the end of the 1800s. Today, white and green marble decorate the interior columns and walls in the same style as the Duomo of Siena and frescoes and Renaissance paintings decorate the chapels inside, while an enormous and stunning stained-glass window serves as the background of the main altar. This unique building is definitely worthy of a visit. The small city is first found on record in 805 CE, and has since then existed under Italian, French, Austrian, and Spanish rule, and today it is a part of the Republic of Italy. Capalbio is a place where art and architecture from across many different cultures come together with nature to create a small oasis on the coast of Grosseto. Although the municipality only has about 4000 inhabitants, it has a lot to offer to visitors, such as unique spaces of art, like Il Giardino dei Tarocchi, or the garden of Tarot cards. The garden is nestled in the countryside, exhibits influence from Barcelona’s Park Guell, and is full of massive contemporary mosaic sculptures designed by Niki De Saint Phalle. The mosaics are made from Murano glass, ceramics and various types of mirrors. The pure, brilliant hues seem magical in a setting of muted green olive trees and pine groves. On the other end of the spectrum, there is the medieval Church of San Nicola, which is full of frescoes and located in the heart of Capalbio. The city also offers the option to explore nature, with its proximity to Lake Burano and its beaches. Learn about the rich and complex history of this quaint town while visiting a range of different sights in just one or two days. Recognized as the first university botanical garden in Europe, the “Orto Botanico di Pisa” hosts a wealth of plants and herbs which have been studied and appreciated since its establishment by Cosimo I de’ Medici, the Grand Duke of Tuscany, in 1544. The gardens originally served as a laboratory for the famous botanist, Luca Ghini of Imola, and they now reside in the heart of the University of Pisa campus, just a few blocks away from their original location. See more than local greenery by admiring and learning, about the endangered aquatic plant collections, flowers and Ginkgo biloba trees preserved since 1787, along with the artwork the gardens have accumulated over the years. For a complete calendar of FAI’s Spring Days (Giornate di Primavera) visit fondoambiente.it.